Investing time and energy in distributor executive conferences is proving to be just one of True Blue Chemicals' profitable tactical marketing initiatives. Investing time and energy in distributor executive conferences is proving to be just one of True Blue Chemicals’ profitable tactical marketing initiatives. “We want to engage really closely with our distributors. This is what these meetings are all about,” emphasised True Blue’s managing director Brad Macdougall when welcoming delegates to the company’s 2015 sales representative conference. 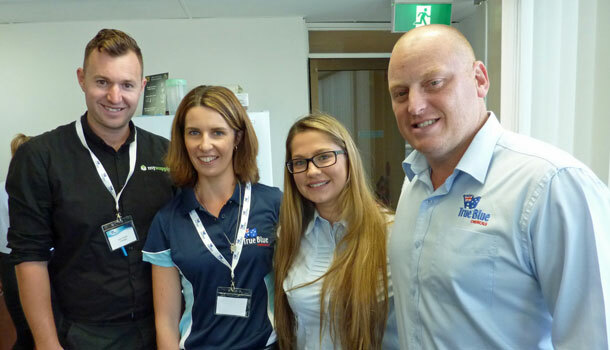 Held 17 September at True Blue’s Sydney head office facility, the one day program covered a number of educational industry and management topics. But perhaps just as importantly, it allowed the sales execs from various parts of Australia to share their ‘solutions’ for a broad range of client sites and needs. Sessions covered included chemical training by True Blue chemist Rianna Goodwin; Selling to Succeed Workshop by national sales manager Dave Stephenson; Globally Harmonised System (GHS) by regulatory officer Sally Fan; New Product innovation by marketing executive Vivienne Aitken; and Core Range Overview by BDMs Clint Rogers and Jason Ryles. An excellent presentation by Goodwin reminded delegates of the vital importance chemical knowledge brings to the selling environment. She covered the ‘four factors for cleaning’ being chemical, time, temperature and mechanical; basics of pH; glossary of cleaners; and SDS as an information source. “By understanding chemicals and how they are designed to work allows you to better sell the product most appropriate to the task as well as alert clients to the incorrect usage of competitive offerings,” pointed out Goodwin. Industry and product knowledge are fundamental to a sales person’s armoury but they need to be complemented with the right sales’ approach and attitude. Stephenson took his audience through a wide range of topics but in essence, his presentation was best reflected by his statement that ‘people buy people’. In a fast paced digital world, relationships and face-to-face calls are perhaps more important than ever. And understanding clients’ businesses is the starting points for sales execs. “I always love being able to solve peoples’ problems,” Stephenson emphasised. He then tackled sales disciplines including ‘pipeline management’, understanding and calculating cost in use and referrals. From this writer’s point of view, Stephenson’s ‘5 before 9’ discipline (five activities before 9am) was a stand-out. Emphasising True Blue’s proactive approach to GHS, Fan explained that Australia will fully transition to the GHS system by1 January 2017. “There will be different symbols and warnings on SDSs and labels and many classifications will change due to different classification methods and lower concentration cut-offs – resulting in a higher degree of hazard. “Some products will become Dangerous Goods by classification so storage at warehouse and customer sites need to be reviewed,” Fan said. Rogers and Ryles reminded the sales execs of True Blue Chemicals’ core products’ features and benefits. The informative presentation covered both housekeeping and kitchen ranges, specifying products for particular cleaning and hygiene tasks. Highlighting the market need for an economical product solution, Aitken introduced the Endeavour commodity range which features four products focused on the hospitality market. She also covered some product enhancements on the existing True Green Range including enhanced solvent and wetting aspects to improve overall product performance.